ThePresent from m ss ng p eces on Vimeo. The Present is a clock with an annual dial that was funded originally through Kickstarter by design collective m ss ng p eces. 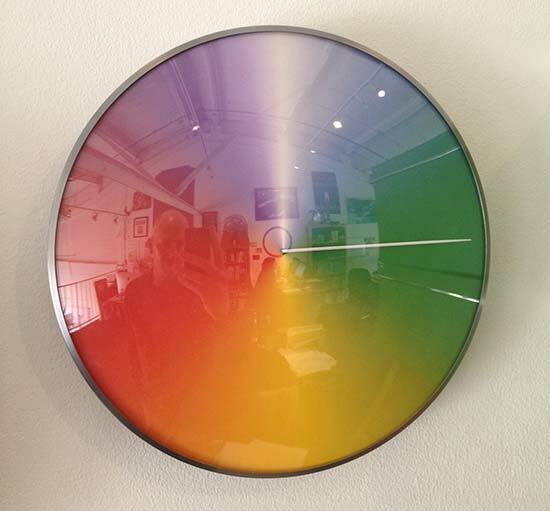 The inspiration for this clock seems to come from a similar place as the Clock of the Long Now. This was one of those early blockbuster Kickstarter projects that reached 4x its fund raising goal. After a couple years figuring out how to produce these as a product, it has finally shipped and we just received ours. It has excellent build quality from what I can tell and auto-magically sets itself as soon as you put batteries into it. Since we are only a few days away from the March Equinox ours moved directly to nearly the “3 o’clock” position in the middle of the green section (see pic below). As we approach summer the hand will move into yellow, then reds for autumn etc.